Size, Condition, or Location? Smart Buyers Choose Two! The housing market has been pretty intense for buyers the last couple of years. Record low inventory and a constant stream of new buyers have made house hunting a harrowing experience. If you want to buy a home in Seattle you are going to have to take a methodical approach in your search process. What does your budget accommodate? Our best advice? Pick TWO! 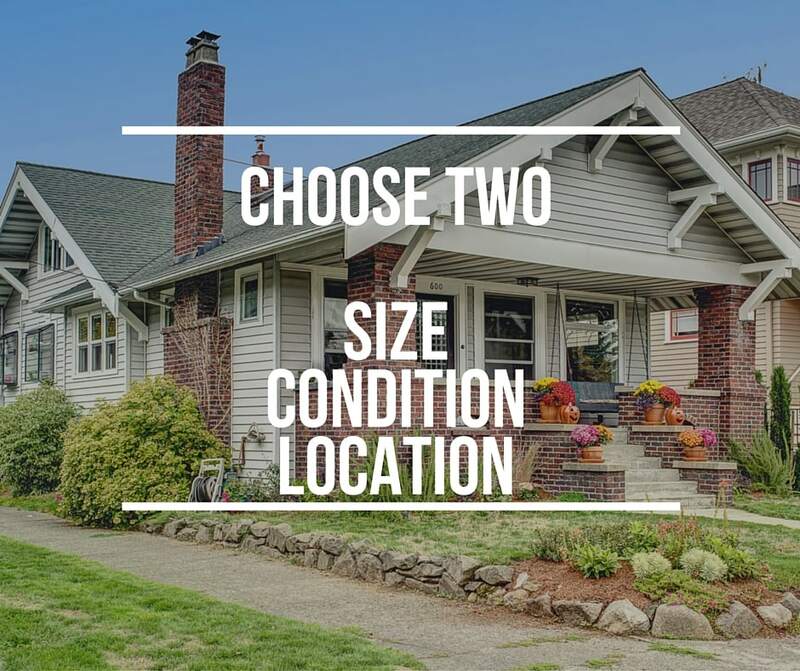 Size, Condition, OR Location! Size: Bigger is not always better, it’s about the right fit. In this market, one of the simplest things buyers can do relatively quickly is figure how much home they actually need to live comfortably over the next five to seven years? Every square foot of that home is money out of your pocket each month. Don’t find yourself paying for extra space you are not using. Do you really need that fourth bedroom? OR can a third bedroom double as a guest room and home office? Think about it, the square footage in the living room that you use every day is costing you the same amount per square foot as the formal dining room you use twice a year. The unnecessary square footage you don’t buy gives you more buying power to find the right size home. Condition: People list their homes in all kinds of various conditions. It’s a pretty simple formula, the better condition the home is in relative to the neighborhood, the higher the selling price. When deciding the condition of the home you want to buy you should ask yourself the following questions. Do I want to do any work? How much work can I realistically take on? Do I have the capital to invest in the work that needs to be completed? Am I going to be able to live through the renovations and upgrades? If you have the capital to do improvements, pairing a home in a great location with a home in poor, but livable condition, is going to give you the biggest bang for your buck. It does not need to be the best location right now either. One smart plan would be to identify neighborhoods that are developing and purchasing a home you can make small improvements on as the neighborhood grows. If you are going to invest in a house that needs work make sure the cost to remodel makes sense for your appreciation. During the inspection ask your inspector to look out for any issues that could prohibit you from completing a successful rehab. Know what you are getting with your major systems, such as plumbing, electrical, and structural. Is that wall you want to rip out supporting half the house? My personal opinion, if there is a major foundation issue you should run. Foundations are usually extremely expensive and the repairs can cause other issues throughout the house. Location: Location, location, location. This is arguably the most famous real estate saying of all time. One word repeated three times to emphasize its importance in real estate. Seattle is at an all time low for inventory and is experiencing extremely high demand. No matter where you buy in the city you are going to pay a premium for the land alone. If location is your primary motivation for choosing a neighborhood you better be ready to shell it out the cash department. Otherwise, you’re probably going to be sacrificing greatly when it comes to size and condition. You’re not the only person that wants to live in a walkable neighborhood, near transit, with great schools and low crime. Better hood= higher price and smaller space. And as always chat with your Diva Team. You might start down a track where location is your primary goal and switch suddenly to condition. 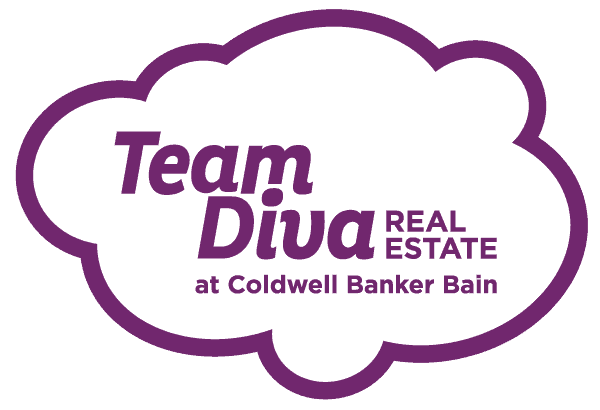 We will work with you to make sure you are making a SMART move!